WD announced the Sentinel DX4000, a new small office storage server with an Intel Atom D525 1.8GHz dual-core processor, 2GB RAM, Windows Storage Server 2008 R2 Essentials, 2 Gigabit Ethernet ports, and 2 USB 3.0 ports. The Sentinel DX4000 is available in 4TB and 8TB models, and supports RAID 1 (2 drives only) and RAID 5 (3-4 drives). Western Digital® (NYSE: WDC), the world's leader in digital storage solutions, is introducing WD Sentinel™ DX4000 (photo), a complete network storage solution designed specifically to meet the demands of today's small-to-medium sized businesses (SMBs). WD Sentinel DX4000 includes the Windows® Storage Server 2008 R2 Essentials operating system software and the Intel® D525 Dual Core Atom CPU. The WD Sentinel DX4000 is centralized shared storage and automatic server-based backup and restore for up to 25 devices (PC and Mac®) in the network. It offers complete data protection with built-in hardware and software redundancy for all of the connected devices in the network. With capacities including 4 TB and 8 TB, WD Sentinel DX4000 lets small business owners expand small office server storage capacity as their business and storage demands grow. In addition, the WD Sentinel DX4000 small office storage server acts as the "on-premise cloud storage" for the SMB. In conjunction with the WD Sentinel DX4000 launch, WD is also introducing SelectWD SMB Partner Program, a channel program that supports IT professionals and VARs servicing the needs of small to medium businesses. The SelectWD SMB Partner Program enables partners to grow their businesses by providing all of the tools and resources required to locally market, sell and support the new WD Sentinel DX4000 and WD Guardian service plans. Partners can learn more by visiting http://www.selectwdsmb.com. 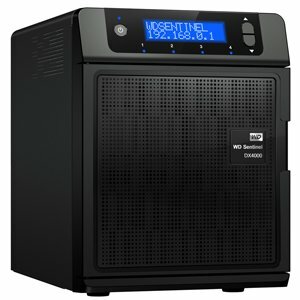 WD Sentinel DX4000 small office storage server is available at select U.S. retailers and online at the wdstore.com. MSRP is $949.99 USD for 4 TB and $1,449.99 USD for the 8 TB.